1. A single user licence that you may use as long as you like. 2. A year's worth of support (email, phone, updates). 3. Ability to influence the development of the software (unique to Professional Systems). Such requests can often be provided as an update on this website within a week of agreement to go ahead. 4. On request we will assist you with installation (using TeamViewer remote access) at no additional charge. Just ask. 5. We will assist with hardware selection should you wish. 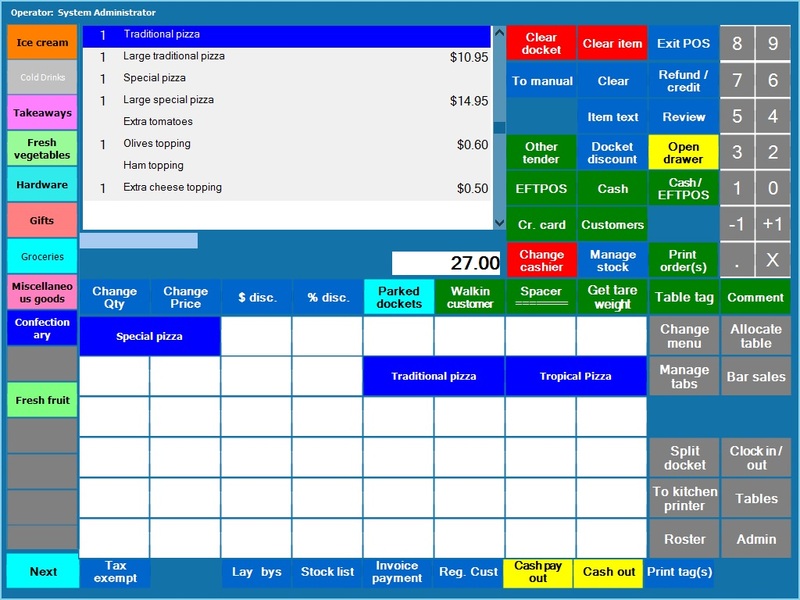 Cash Register has been designed specifically for the small retail store. Especially convenience, dairy, takeaways and general retail. 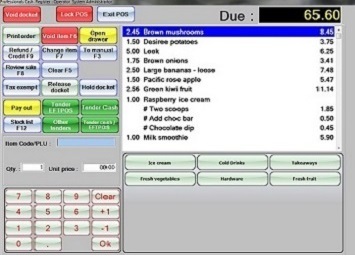 The POS is intuitive to use. So little, or no, training is required once the system is set up. Once you have set up the company record and the required stock you are ready to go. 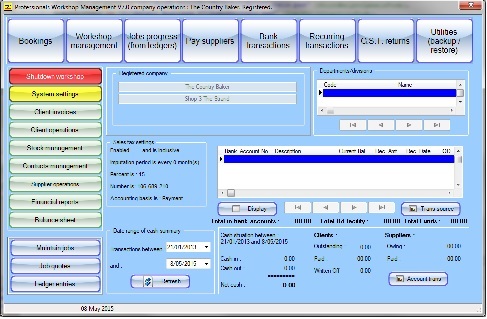 A multi-user option is available if you wish to maintain stock in the back office while cashiers deal with customers. The software works well with either touchscreen or keyboard/mouse operation. The Hospitality Suite has been designed from the ground up to be easy to use. 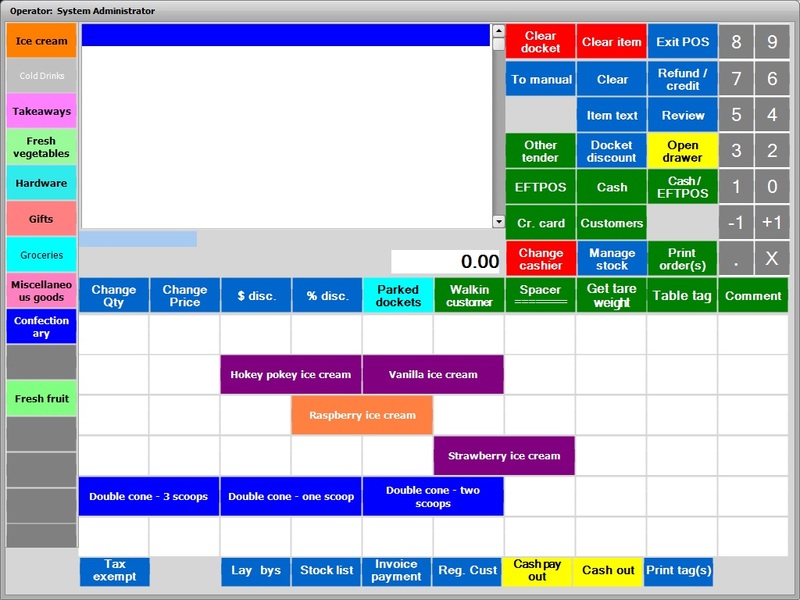 The Full Service interface provides support so staff can provide a complete, accurate, and speedy service for diners. 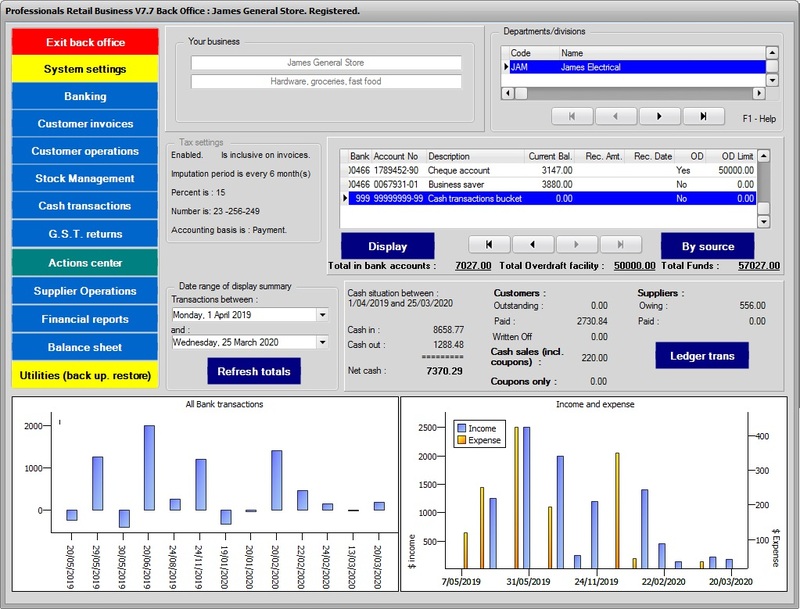 The point of sale interface has been designed to be responsive, accurate and simple to use in high demand situations. You can include reservations, tables and menus. Regular customers can look forward to a service based on the staff knowing their tastes and providing loyalty and discount options that mean they are likely to return. Ideal for the small, sole, operator with little, or no, accounting background. Use Business Accounts to track customer debt and make sure you get paid on time. If your requirements are more sophisticated Business Accounts can support them. Designed for contractors and small businesses running a workshop. Workshop management allows you to track progress on jobs and recover costs. Multi-stage jobs are fully supported. You can provide quotes and estimates and convert them into invoices at the click of a button. Annual support. Includes G.S.T. A tax invoice will be provided. Annual support means we provide regular updates of the software at no extra cost, remote support, email and phone support. You have the ability to influence the direction the software goes in. Single support call - for customers not covered by support agreement. Purchase single support event. $50.00 incl G.S.T. This covers the resolution of a support request. Up to 15 minutes duration. Not just a single contact. Simple to set up, simple to use. Select the number of lanes you wish to purchase. We will provide you with an installation DVD on request. Other wise we will arrange download files for you. Please advise if you wish Professional Systems to set up the menus for you. Contact us here (09) 432 8904. Purchase Professionals My Cafe. To download installation files. Professionals My Cafe - for cafes, coffee houses and takeaways.